NASA wants to explore the open caverns on the Moon. 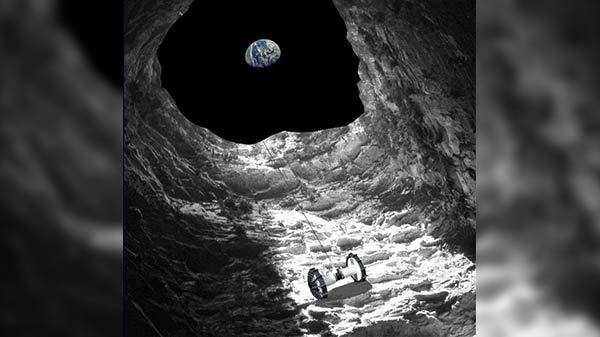 NASA seems to be planning to send an extreme-terrain rover to explore mysterious caverns lying beneath the lunar surface. The primary aim is to look for clues to the history of the Moon. Caverns might also provide ready-made habitats for future crewed missions, giving shelter to astronauts and preventing them from extreme temperatures, radiation, and asteroids that impact the lunar surface. The open caverns were formed when the ceilings fell down into the lava tubes under the lunar surface. Dubbed Moon Diver, the rover would take flight atop a rocket in the mid-2020s and touch down a few hundred feet away from the Moon's deep pits on the Sea of Traquility basin. There, a smaller rover will be deployed called Axel that will rappel hundreds of feet into the large pits, reports Smithsonian Magazine. The rover's wheel wells will analyze the caverns, collecting data on the ancient rock beneath the surface. "There is nice poetry to this mission concept. Apollo 11 landed along the edge of the Sea of Tranquility. Fifty years later, we are going to dive down right into the middle of it," said Laura Kerber, a NASA Jet Propulsion Laboratory researcher and principal investigator of the Moon Diver mission. Besides, the US space agency is also planning to send astronauts back to the Moon within five years "by any means necessary." NASA previously aimed to go to the Moon by 2028, after first putting a "Gateway" station in orbit around the Earth's natural satellite by 2024.